Sri Lanka is blessed with so many varied archaeological sites of historical and cultural importance that the visitor is spoilt for choice. While the expansive ruins of the ancient cities of Anuradhapura and Polonnaruwa have a grandeur that is difficult to surpass, there are lesser-known sites that have an ambience all of their own. This frequently stems from the fact that they lie off the beaten track, are on a smaller scale, and are encircled and even encroached upon by jungle. 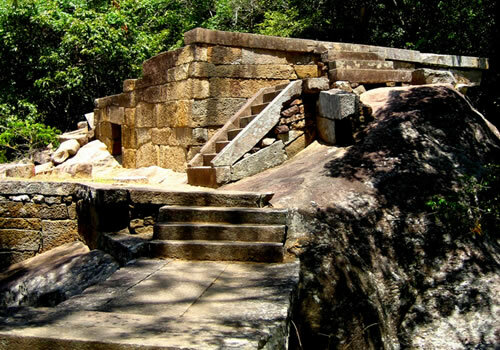 One such site is the monastic complex on the lower slopes of Ritigala-kande – the Ritigala Mountain - situated in Sri Lanka's North Central Province, 25 miles (40 kilometers) southeast of Anuradhapura. 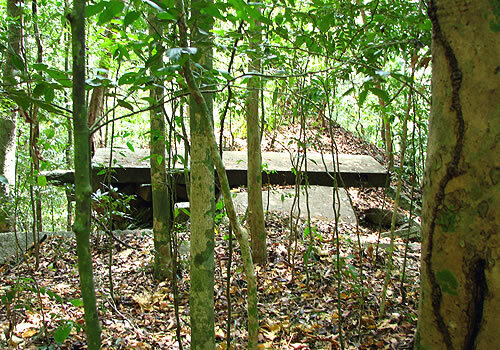 These ruins are some of the most distinctive the island has to offer. 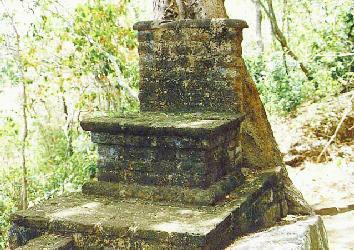 The Buddhist dagobas (domed relic chambers) and statuary of Anuradhapura and elsewhere are conspicuous by their absence. 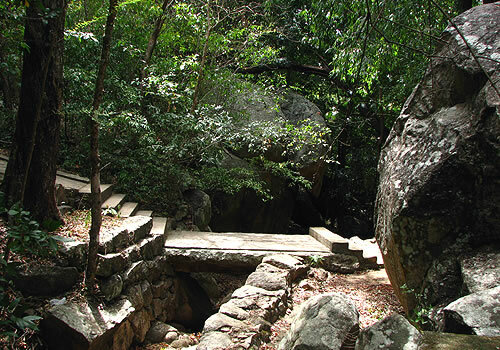 Instead, the monastery largely consists of meditation platforms and walkways that are in perfect harmony with the huge boulders, noble trees, and burbling streams of the sylvan environment. That these unadorned yet inspiring ruins are situated at Ritigala, a mountain steeped in legend and mystery, adds to their attraction. I made the first of many visits to Ritigala in the company of a learned Sri Lankan friend nearly 30 years ago, when just getting there was an adventure in itself. The steep jungle-clad mountain, rising imposingly to a height of 2,514 feet (765 meters) above the surrounding plain, was easy enough to spot as we traveled the Anuradhapura to Habarana main road. From this point, Ritigala gives the illusion of being tantalizingly close. Yet I was soon to discover that our destination, the access point at the base of the northern slope, was still some way off. The real journey began when our jeep swung off the main road at a small village onto an inconspicuous track. "This is Galapitigala," my friend and enthusiastic guide explained as we quickly left the village behind us and drove into the enveloping scrub jungle and grassland. "It means ‘rock-upon-rock,' no doubt referring to the large rocks on top of each other hereabouts, which appear to have been placed there by giant hands. Indeed, there is a local legend concerning two giants, Sona and Ritigala Jayasena, who fought a duel nearby. Sona was defeated and his spirit is said to haunt the area." Our progress slowed, for the recent monsoon rains had eroded large sections of the sandy track, leaving gaping chasms that had to be negotiated with extreme care. I fixed my gaze on the looming mountain as my friend began to tell me more of its myth and mystery. "There are many legends associated with Ritigala," he continued, "but the oldest and best-known concerns the Indian epic poem, the Ramayana, which was written some 3,000 years ago. The Lanka of the poem is, of course, Sri Lanka, and the mountain called Aristha is almost certainly Ritigala." He went on to relate how Hanuman, the warrior monkey-god, came to Lanka in search of Lord Rama's wife, Sita, who had been abducted by Ravana, the king of demons. After Hanuman had tracked down Ravana to his stronghold, he used the Ritigala Mountain as a launching pad to take a great leap across to South India in order to convey the news to Lord Rama. A monkey army led by Hanuman then crossed the straits separating South India from Lanka and waged war against Ravana. Eventually the demon-king was defeated and Sita restored to her husband. "By the way," he added with dramatic emphasis, "Ritigala is in fact the highest prominence between here and South India." At this juncture we were forced to alight from the jeep while the driver circumvented a particularly wicked rut. As he did so, I took the opportunity of observing the cloud-shadowed mountain, and imagined the simian leap from its summit that had taken Hanuman northwards. "Legend also has it that when Rama's brother was wounded in battle, a medicinal herb was required to save his life," my friend continued once we were on our way. "Hanuman was dispatched to the Himalayas to fetch this particular herb, but by the time he arrived he had forgotten its description. So he brought back a fragment of the Himalayas containing many herbs twisted in his tail, in the hope that among them might be the correct one. However, the mountain fragment slipped and fell while Hanuman was over Lanka, and it broke into three pieces. These landed in different locations, one of which was Ritigala. "Perhaps this part of the legend came about because the Ritigala summit - which has a strange mini-plateau - does possess a pocket of vegetation that is distinct from the dry-zone flora of the lower slopes and surrounding plain. There are stunted trees festooned with hanging moss and, yes, there are many herbs. This anomaly is due to the fact that the summit has a cool and wet micro-climate. Indeed, clouds and mist envelop the summit for a greater part of the year. The result is high vapour condensation that keeps the earth moist." I asked my friend about the derivation of the name Ritigala as we passed a lone farmer tending his isolated chena - a field created by cutting and burning the jungle. "There are several theories, all of which are apt. Some say that Ritigala means ‘the rock as steep as a long pole,' others that it is so-named on account of the numerous Riti trees in the jungle nearby. However, the Mahawansa, the island's ancient chronicle, calls it Arittha-gala, which means ‘dreaded rock,' possibly because it was the abode of the fearsome Yakkas, the aboriginal inhabitants of Lanka. Over the passage of time, it is suggested, Arittha-gala was modified to Ritigala.  "To confuse things, arittha can also mean ‘safety,' an appellation that perhaps came about because the mountain provided an ideal haven for royal victims of injustice. For example, Prince Pandukabhaya encamped at Ritigala for seven years during the 4th century BC while he gathered an army to wage war against his eight uncles, who prevented him from ascending the throne. It was at the foot of the mountain that the decisive battle was eventually fought, in which Pandukabhaya killed all his uncles. After becoming king he founded the royal city of Anuradhapura. " After a five-mile (nine-kilometer) journey, we happened upon a junction in the scrub jungle, dominated by a tall tree bearing a sign that read "Ritigala." We turned onto an even narrower track, which, although less rutted than before, was hemmed in by impenetrable thorn bushes. Several miles later, the track took a bend and came to an abrupt end in a clearing at the very foot of the mountain, where the scrub gave way to magnificent, boulder-strewn forest. On one side of the clearing, nestling under a tamarind tree, was a timbered hut - the Ritigala Archaeological Department office. As I clambered from the jeep I remember being struck by the tranquility and stillness of the place, an atmosphere that only a forest environment can create. We were greeted eagerly by two resident Department guides who took us on a tour of the ruins, starting with the ritualistic bathing pool of immense proportions, the inner face of which is lined with continuous stone steps. Breached and silted up, it was nevertheless evident that it had been an impressive feat of engineering. "When Buddhism became established in the island, Ritigala was selected as a suitable spot for the construction of vihares, or temples," my friend explained as we skirted the pool. 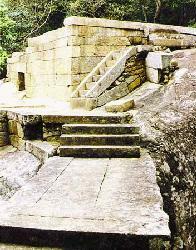 "The first, the Lanka Vihare, was founded near here at the foot of the mountain in the 2nd century BC. Another, the Arittha Vihare – from which, incidentally, the mountain may also have got its name – was founded a century afterwards. Much later, in the 9th century AD, King Sena made additions by constructing a larger complex higher up the slope for a group of ascetics-priests called the Pansukulikas. These priests, who had broken away from their brethren in nearby Anuradhapura, were dedicated exclusively to the exercise of meditation and contemplation. "There are scores of natural caves on the slopes of the mountain that were donated by laymen to the priests for the practice of meditation. Many are small, but some are quite large. Before presenting his gift, the donor had to drive away animals and snakes, fumigate, clean and plaster the interior with lime, wall in the entrance, hang a door, and cut a drip-ledge in the rock above to divert rain-water." We crossed the bed of the stream feeding the bathing pool and reached the beginning of a stone footpath some 5 feet (1.5 meters) wide that meandered upwards through the trees. The overhanging branches diffused the light to such an extent that even the fierce noonday sun was reduced to a soft glow. Furthermore, the air was surprisingly cool, and there was a serene atmosphere that made it easy to appreciate why the Pansukulikas chose this place for their contemplative perambulations. The path, which leads to the monastic complex proper, displays extraordinary craftsmanship, being beautifully laid with interlocking ashlar (irregular quadrilateral slabs of hewn stone) in patterns of two, three and four. In addition, it is edged with proportionate curbstones. There are three places in the ascent that incorporate a large circular platform circumscribed by perfectly curvilinear slabs of stone. These remarkable features were probably resting-places. We reached the end of the path and the knowledgeable guides gave us a tour of the various monastic facilities scattered about the forested slope. They took us, for instance, to the remains of the small hospital with its stone beds and basin-like stone oil baths, and to one of several meditation walks, some 36 paces long and terminated at each end by two huge perpendicular shields of stone. 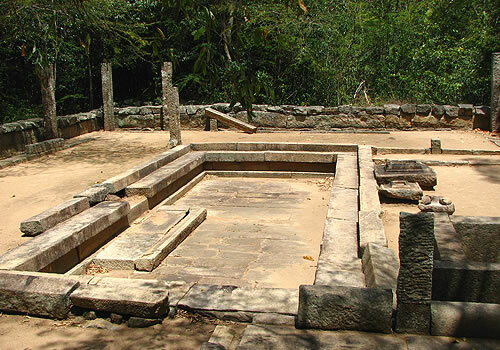 They showed us the remains of some extraordinary buildings known as double-platforms, which are characteristic of Ritigala and similar forest monasteries. A stone bridge connects two raised platforms, created by building retaining walls on the slope. 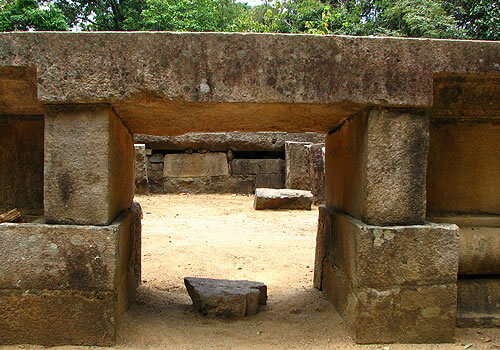 One platform is rectangular and appears to have been open to the elements, while the other is square, and was quite likely roofed and divided into eight or nine rooms. The precise purpose of these double-platform buildings is not known, although it is believed that the open platform probably had a congregational function. As we descended by a different route, through a landscape of forest and streams, I asked my friend about the ultimate fate of the monastery. 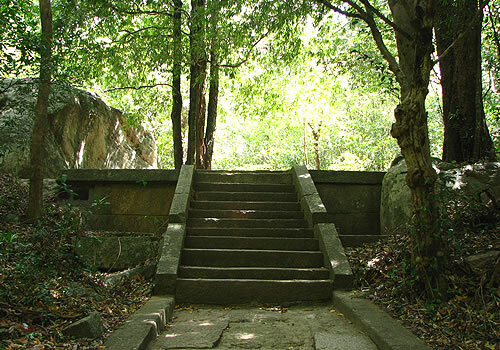 "When the capital moved from Anuradhapura to Polonnaruwa in the 11th century the Pansukulikas fell into decline," he told me as we encountered an artificial waterfall contrived by placing a stone slab between two rocks. "The monastery and caves of Ritigala became submerged by jungle and largely forgotten until the latter half of the 19th century, when the British came upon them." Dusk was approaching by the time we bade farewell to the guides and began the return journey along the lonely jungle track. At one point our driver peered nervously into the gathering gloom and started to recite an incantation. I threw a questioning glance at my friend. "He's reciting a mantra to ward off elephants, " was the unruffled reply. "You didn't notice it, but we passed a bull elephant a little while ago." 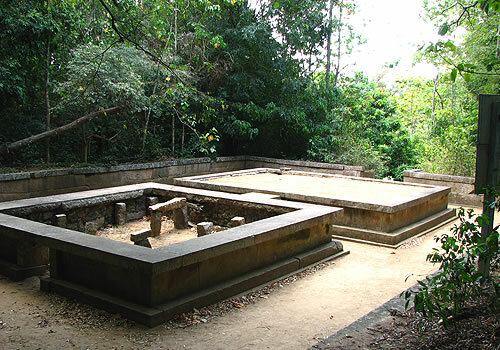 Much can change in 30 years, even an archaeological site, but thankfully Ritigala remains largely the same. What changes there have been are for the good. 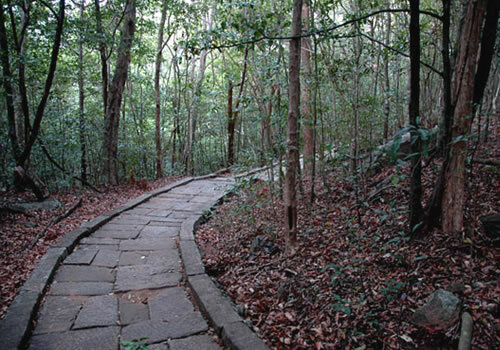 The Ritigala Mountain has been declared a Strict Natural Reserve in order to maintain its pristine environment. In addition, the Archaeological Department has sensitively restored many of the ruins. Thus the visitor now has a clearer impression of their splendour. With the construction of hotels in the Habarana and Dambulla areas, Ritigala is now more conveniently located. Access has improved, but visitors should be cautious during and after seasonal rains.